Here is one simple tip to protect your copyright that you can do for free, yourself. You can do it yourself, you don’t need a lawyer. All it is, is applying the © copyright symbol. I have been in a workshop recently and I had a little look at the workshop notes and the workbook provided for the workshop. I said to the organiser (who is also my client), “hello, you don’t have the copyright symbol on there”. I was so frustrated with her because she has been buddies with me for over three years and has heard me talk about the importance of using the copyright symbol. So, when she watches this video or reads this blog, I hope she is going to go right home and change her workbook and put the copyright symbol on it. To get the copyright symbol, you go into MS Word, do an open bracket (, type the letter C, and type a closed bracket ). That will give you the little C in the circle. Then you type in the year of the first date that you started creating the materials. So if you created it five years ago, you would put five year’s date. Then type in a dash and the most recent year you updated the material. Then you put the copyright owner’s name on it (your name if you created the copyright work for yourself). If someone else created it for you, you will need to have something in writing to say you own the copyright (even something by email confirming this is fine). I recommend putting that in the footer of every single piece of paper that you create or give out, whether paper-based or electronic. You should also use the copyright symbol on videos you create (showing it once right at the end is fine). I have another client who also didn’t listen to me and also didn’t put the copyright symbol on her workbooks and what happened? Her workbooks started appearing all over the place and she couldn’t actually prove they were her creation. This is a free, easy tip for you to apply to your own work. Go and do it right now. Insert the copyright symbol (provided it is your own work, and not copied from someone else – copying work from someone else risks you being sued for copyright infringement, so I strongly recommended you do not copy, and rather create your own materials from scratch). What do you need to put the copyright symbol on? Anything you’re handing out to people. Including electronic things. So if you have a “magic PDF” that’s got some tips on it, a tip sheet, put it on there. The person who receives it is less likely to either copy it or send it to their friends if it has got your copyright symbol on the bottom. Also, I have a marketing tip for you. This is not a legal tip. I always put my email address on the bottom of any of my handouts. If my buddy sends one of my tip sheets onto their friends then they can see aha, that came from Cathryn Warburton. They will have my email address and they can contact me if they want more information. So, don’t be like my friend, don’t throw your copyright work down the toilet. Go and insert the copyright symbol into your work right away. 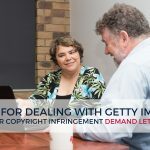 Please note that in Australia and New Zealand (and most other countries, there is no system of copyright registration (but there is in the USA). This information is specific to works created in and enforced in Australia and New Zealand. Feel free to email us at website@acacialaw.com if you need more information about copyright, including registration of copyright in the USA. Book a complimentary phone call with Cathryn, by clicking this link or by email to website@acacialaw.com (only available to people with businesses based in Australia or New Zealand). She would love to chat to you about your IP and business legal questions. Cathryn Warburton is the Legal Lioness. With more than 2 decades of experience behind her, she legally bulletproofs her client’s businesses and protects them from business bullies. She is a multi-international award winning lawyer, trade mark attorney, patent attorney, author, mentor and keynote speaker.